All eyes are zeroed in on state title No. 14. The Whitman-Hanson Regional High cheerleaders are back on the mats and in full force. Forty kids turned out to tryouts in late August, enough for first-year head coach Alyssa Hayes, who took over the team on a temporary basis in February, before being named to the position full time in April, to fulfill her goal of forming a junior varsity team. Decorated seniors Anna Franklin and Shelby Newcomb captain the varsity team alongside junior Ryley Hurley. “They, honestly, the three of them are the best of friends, and that’s how they treat the rest of the team,” Hayes said. The trio doesn’t just guide the team on the mats, but through the halls as well. Hayes is expecting the same positive attitudes to push the Panthers forward this fall that did last winter, which culminated in state title No. 13. “They seem to all really get along and love each other, which is something you usually have to build up to,” Hayes said. The Panthers have seven returnees from that title winning team. In addition to their three captains, senior Maddy Anderson, junior Kaylee Diehl, and sophomores Olivia McCarthy and Savannah Po- irier are all back. And, first up on that competition schedule is the Oliver Ames Invitational on Sunday, Oct. 21. Six days later on Oct. 27  will be the Braintree Invitational. Whitman-Hanson Regional High alum Kayla McCormack (’12) has been named the head coach of Marshfield High’s cheerleading team. Kayla McCormack has spent much of her life in the sport of cheerleading, learning every step of the way, thus priming her for her newest position. McCormack, a 2012 Whitman-Hanson Regional High graduate, was recently named head cheerleading coach at Marshfield High. “I’m really excited, I can’t wait to get started,” she said. McCormack began cheerleading in third grade and quickly came to the decision it was the right sport for her as it mixed two of her favorite activities. While at W-H, McCormack was a four-year varsity cheerleader and helped the Panthers to three state titles (fall of 2008 and 2011, winter of 2011) and a national crown (2010). She captained the team her senior season. McCormack also served as an assistant coach at the youth level during her time at W-H. It was in the capacity that she developed even more of a fire for the sport. McCormack then went on to Quinnipiac University, where she captained its acrobatics and tumbling team, earning NCATA All-America honors. McCormack’s time there was a major stepping-stone for her. After graduating from Quinnipiac in the spring of 2016, McCormack’s next stop was a return to her high school alma mater. McCormack served as an assistant coach on the W-H cheerleading team for the 2016-17 school year, putting the skill set she had been developing over the years to use. The Panthers claimed their first national title in four years during McCormack’s 10-month stint. Her ties to the Marshfield cheerleading program stem from her time working as a tumbling instructor at a nearby gym, Cheer Essentials, a post she began in 2010. Alyssa Hayes, a Whitman-Hanson Regional High alum, has been named the school’s head cheerleading coach. Alyssa Hayes, recently appointed head coach of Whitman-Hanson Regional High’s cheerleading team, shared her opinion on what makes the program so special and how she aims to continue its legacy. After the resignation of the previous head coach in February, Hayes was one of three coaches who stepped in and helped guide the program to its 13th state title. Hayes, a 2012 graduate of W-H, is in her first year as an English teacher and head coach of the boys’ tennis team at the school. Q: When did you first get involved in cheerleading? Q: What do you find most fascinating about cheerleading? Q: When somebody says “cheerleading”, what are the first three words that come into your mind? Q: When did you begin coaching cheerleading? Q: Being an English teacher, do you see any parallels between that role and coaching? Q: What, if anything, did you change with the program when you came on board? Q: What was so special about that roughly month-and-a-half experience you had coaching this team in the winter? Q: Is there anything specific you learned from your cheerleaders last winter that helped you develop as a coach? Q: What is it that makes this Whitman-Hanson cheerleading program so special? Q: Finally, is it safe to say this is your dream job? After winning nationals last season, the Whitman-Hanson Regional High cheerleading team is vying for another title. It’s off to Dallas for the Whitman-Hanson Regional High cheerleaders. The team will head for the Lone Star State Friday morning, where it will compete in the NCA Senior & Junior High School National Championship, held at the Kay Bailey Hutchison Convention Center. The two-day tournament, which spans from Saturday to Sunday, boasts many of the top teams from across the country. Last winter, the Panthers, in their third straight trip to the tournament, captured the Small Advanced High School division. W-H head coach Tanisha King, who is in her sixth year at the helm of the program, said the NCA is one of the most prestigious competitions in the country based on the fact that teams must score a certain average at the state-level to even be invited. King added that embarking on such a journey does draw them closer together. “It definitely is a team bonding trip,” King said. “Whenever we do go there I do try to do certain things outside of our competition. In years past we’ve gone to the aquarium, the zoo, last year we took a tour of the Dallas Cowboys’ stadium, so we get to do things as a team we obviously wouldn’t be able to do here in Massachusetts, so it’s nice to do that. 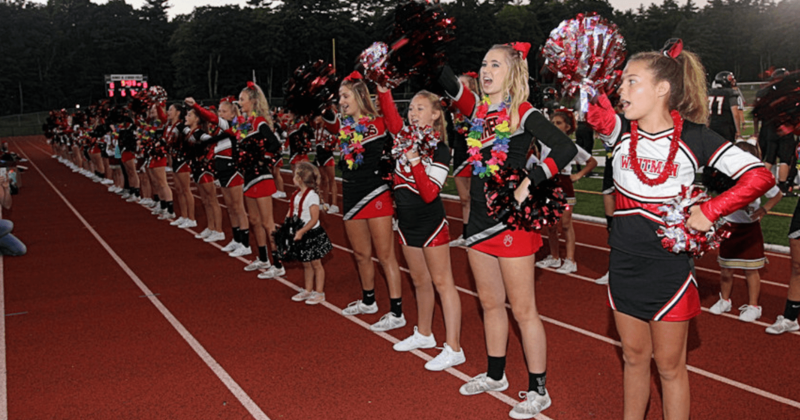 So far this year, the cheerleaders – led by junior captain Anna Franklin – have captured a league title, regional crown and state title all during the fall. King said she’s seen an immense amount of growth from her team, which boasts just one senior after graduating four off last year’s roster, as the season’s worn on. While the cheerleaders have endured great success, considerable time and effort has gone into that, and even more is needed before heading to Dallas, where they’re forced to alter their entire routine. The NCA consists of a minute-long cheer, while stunting, tumbling and moving, where back in Massachusetts the girls’ whole routine is performed to music. Last winter, W-H followed up its national championship winning trip to the NCA with a league title, regional title, state title and New England tile. But first thing is first, it had to get the job done in Dallas.